have i ever talked to you about my cookie preferences? well, let’s get it out there officially: i like my cookies to be soft. sure, if you throw a crunchy or crispy cookie at me, i’ll eat it, but it’s not going to steal my heart in the same way that a soft cookie will, especially one that’s still warm out of the oven. i had a little free time yesterday afternoon, + decided it was the perfect time to do a little baking. honestly, though, is there ever a bad time to do some baking? 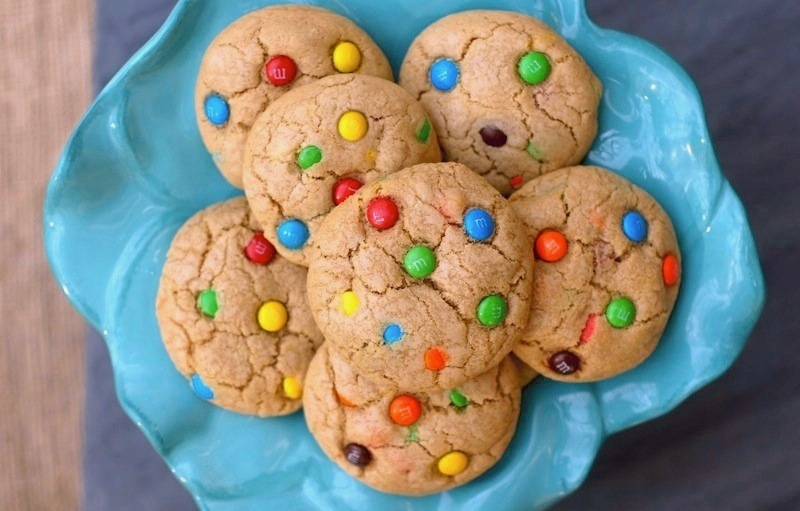 i remembered that i had some mini-m&ms in the house, begging to be used, so i searched for a recipe to feature ’em, + stumbled across this fabulous-sounding recipe from how sweet eats. and let me say, i’m soooo glad i did. mix the flour + baking soda in a bowl + set aside. in another bowl, whisk together the melted butter, brown sugar, + white sugar until they are combined. add the egg, egg yolk, salt, + vanilla + stir until mixed. gradually add flour + mix until a dough forms – it will look crumbly at first, but it will come together – i found that using my hands was the easiest way to mix it. fold in the m&ms. decide if you’re going to make giant cookies, or regular-sized cookies + divide dough accordingly – 1/4 cup portions for giant cookies or 2 tablespoon portions for regular-sized cookies. roll each portion into a ball then place on a non-stick/silpat-lined baking sheet, leaving about 2″ between cookies. 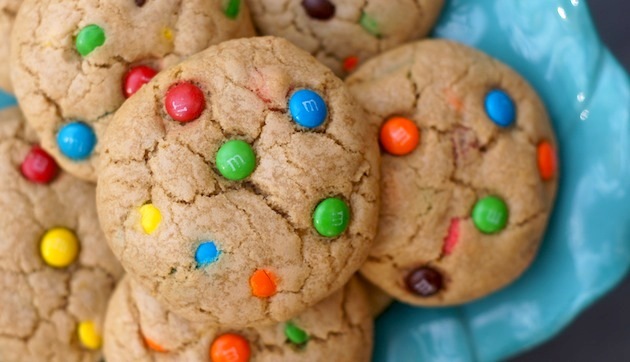 depending on how many m&ms are visible in the dough balls, feel free to add a few more m&ms to the tops/sides of the cookies – that’s what i did, which resulted in the gorgeously m&m-y cookies above. amy’s optional step: put the baking sheet of cookies in the freezer for 5 minutes before baking. i do that with a lot of my cookies, which seems to result in them keeping a great shape + height. let cool for about 5 minutes on the baking sheet, then transfer to a cooling rack. cookies will keep for about a week in an airtight container. 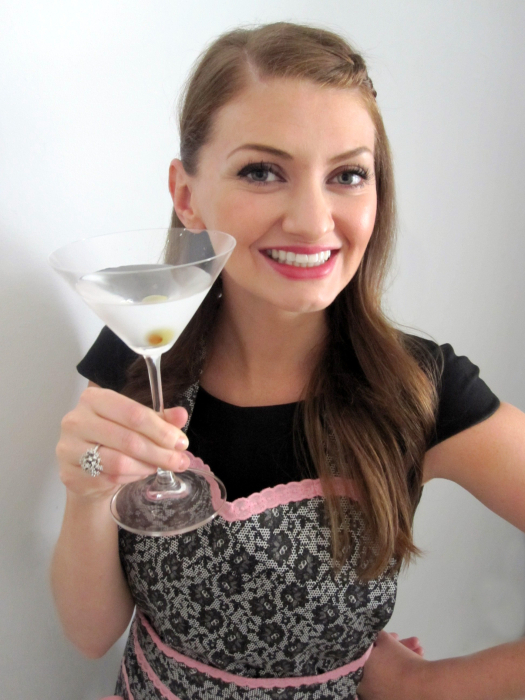 I just made the recipe and it is wonderful! I tried another recipe and I ended up with flat cookies. But your tips worked! My daughter will be bringing these cookies to school to celebrate her birthday. Thanks for posting this!